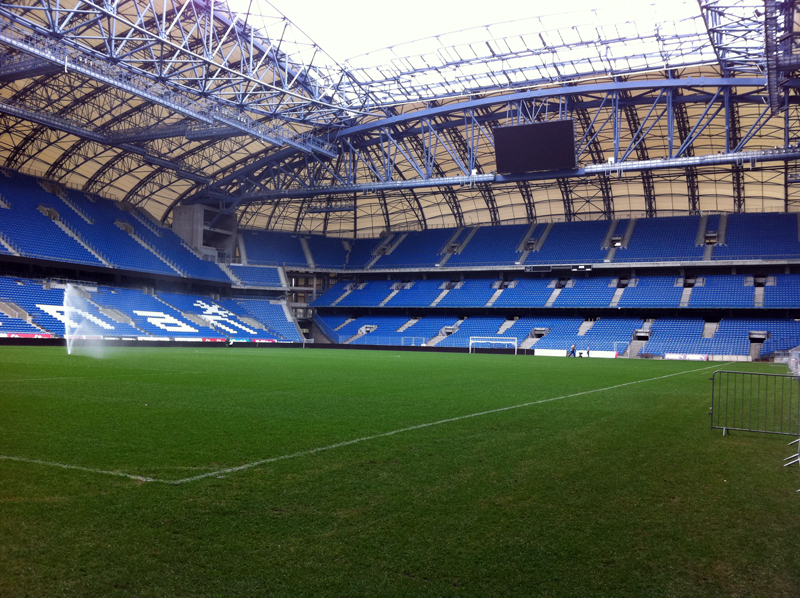 Municipal Stadium in Poznan at Bułgarska street was the first Polish facility ready for the Euro 2012. Each of the three group matches of the finals of the Europe championships will be watched by 41 000 spectators. The construction of the stadium in Poznan started in the ’60s, and the opening ceremony was held in August 1980. Since that time the facility has been modernized. The beginning of last reconstruction was in 2002. When Poland received the right to organize Euro 2012, it was decided to introduce changes. Plans of the changes were developed by Modern Construction Systems company. The reconstructed facility was completed in September 2010. The stadium, covered with a membrane roof, has already 43 000 seats. However, according to the UEFA requirements, the number of seats will be limited to 41 000 seats. The stadium has also seats for the disabled. Designers have taken into account the ecological criteria such as installation of underground tanks for rainwater, which will be used for spraying the stadium grass. In September, the selected operator of the stadium is a consortium with the share of KKS Lech Poznan and the Marcelin Management company. The agreement with the city was signed for 20 years. The first event at the Municipal Stadium in Poznan was the concert by Sting (20 September 2010). League matches and the European League created an amazing atmosphere at the stadium. In general, during the first year of operation of the stadium it was visited by almost million people. The problem of the stadium was the stadium grass. Since December 2009 it has already been replaced six times. Problems with the grass resulted from the fact that it had no time to take roots because of regular matches between Lech and Warta at the stadium. In addition, the grass was most often put in difficult weather conditions – in late autumn or even in winter. The problem with stadium grass occurred also in England at ht e most expensive stadium in the world – Wembley. Objections to the stadium was also raised by UEFA but the problems were solved. While visiting the stadium in Poznan, Michel Platini, president of UEFA, had good opinion about the stadium and the progress of preparations of the city for the Euro 2012. 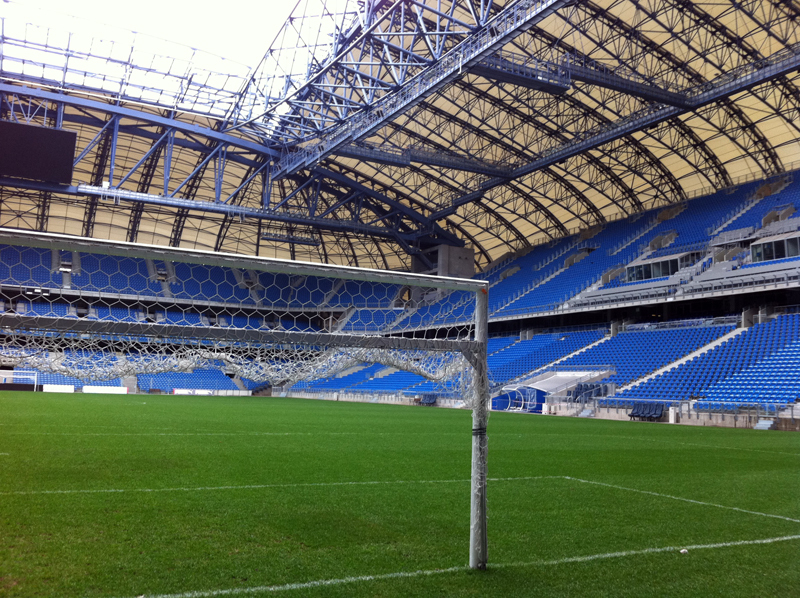 Capacity – 43 000 seats (For Euro 2012 – over 41 thousand). 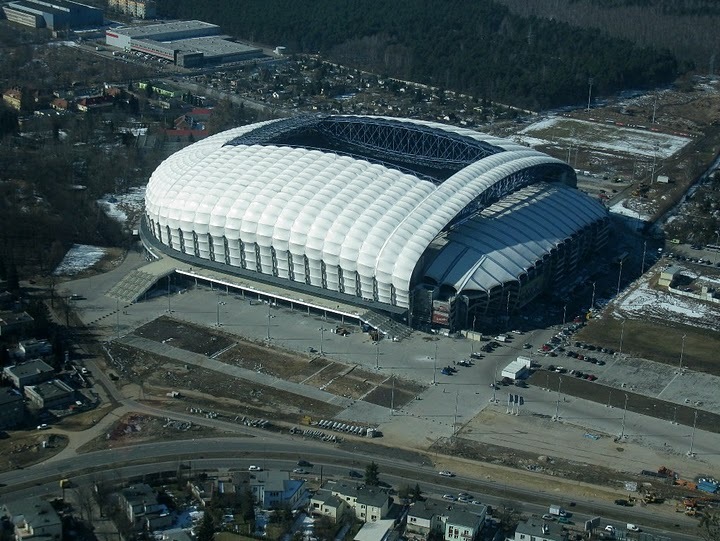 This is my favourite of all the stadiums for Euro2012..Poznan stadium reminds of my own clubs ground a bit..It has that English style ground look. I am an ASTON VILLA FAN and this stadium reminds me of ours a little bit only this is more beautiful. We have 45,000 seats though while this has 41,000? This is a beautiful stadium. I would love this style of ground at Villa Park in the future and I will be sending the pictures of it to our owner Mr Randy Lerner so he can hopefully get some ideas for the future when he decides to rebuild certain parts of our ground, Villa Park.. I want to wish everyone in POLAND and UKRAINE the very best of luck this summer for Euro2012. All the stadiums look beautiful. Polish and Ukraine fans are among the best in the world and I hope both teams give the home fans a lot to be proud of this summer as long as you do not beat my IRELAND..lol..Best Wishes!!! Aston Villa FC and IRELAND fan in peace!